UIS Speakers Series explores "Free Market Environmentalism"
WHAT: The University of Illinois Springfield’s Department of Liberal & Integrative Studies and Engaged Citizenship Common Experience (ECCE) Speakers Series present “Free Market Environmentalism”. This presentation will explore the approach to environmental problem solving that focuses on improving environmental quality using property rights and markets. The featured speaker will be Terry Anderson, executive director of the Property and Environment Research Center. WHEN: Thursday, November 13, 2014 from 4 to 5:30 p.m. DETAILS: Terry Anderson, a Jean De Nault Senior Fellow at Stanford University’s Hoover Institution, will emphasize three important points in free market environmentalism including that economic growth is fundamental to improving environmental equality and that property rights make the environment an asset rather than a liability. Anderson’s research helped launch the idea of free market environmentalism and has prompted public debate over the proper role of government in managing natural resources. Anderson is the co-chairman of Hoover’s Property Rights, Freedom and Prosperity Task Force. He has written or edited thirty-seven books. His book, Free Market Environmentalism, co-authored with Donald Leal, received the 1992 Sir Antony Fisher International Memorial Award. For a list of other upcoming ECCE Speakers Series events and more information, visit http://illinois.edu/goto/speakerseries. All events are free and open to the public. 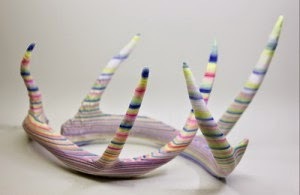 The University of Illinois Springfield Visual Arts Gallery presents Copy Shop, and exhibition of 3D printed and digitally fabricated objects by Chicago-based artists Tom Burtonwood and Holly Holmes. Working from a variety of sources, Burtonwood and Holmes create 3D printed modular works that borrow from natural systems of organization. The artists utilize simple mechanical connections to create novel and unique juxtapositions of forms and meanings that promote adaptability, contingency, variability and an open course philosophy. The exhibition will open on Monday, November 3 and run through Thursday, November 28. A lecture and exhibition reception will take place on Thursday, November 6. The lecture will take place from 5:30 to 6:30 p.m. in the Sangamon Auditorium Lobby, located in the Public Affairs Center (PAC). The reception will take place in the Visual Arts Gallery, located in the Health Sciences Building (HSB 201), from 6:30 to 8:00 p.m. The UIS Engaged Citizenship Common Experience (ECCE) Speakers Series and the Statehouse Inn serve as sponsors for this lecture and exhibit. All events are free and open to the public. As the sampler was to hip-hop so the 3D printer is to sculpture and designed objects. Open source 3D printing has paved the way for a revolution in making things. 3D printing and scanning combined are time machines. They reach back into the past and teleport objects of antiquity around the globe, reproducing and sharing them for everyone to touch and hold in their hands. Just as blogs disrupted publishing, and smart phones changed communications so 3D printing, scanning and modeling will transform the world of objects and the services that surround them. A component of the exhibit will borrow from Springfield’s Dana Thomas House, designed by Frank Lloyd Wright and a showcase of his Prairie Style. The artists have created a 3D print of a fragment of the house that captures portions of pattern that exemplify the Prairie style. From that 3D print, the artists have created a mold that the audience can use on-site to create their own small-scale copy to take away. Design innovations of the past merge with contemporary design innovations through this process and product. The UIS Visual Arts Gallery is centrally located on the UIS campus in the Health and Science Building, room 201 (HSB 201). Gallery hours are Monday through Thursday, 11 a.m. to 6 p.m. This program is partially supported by a grant from the Illinois Arts Council Agency. For more information exhibition programming, please visit the UIS Visual Arts Gallery website at www.uis.edu/visualarts/gallery, or contact the gallery at 217/ 206-6506 or alach3@uis.edu. The 100th anniversary of women’s suffrage in Illinois serves as the backdrop of a presentation on Public Discourse, as part of the University of Illinois Springfield Lunch & Learn series. Angel Ysaguirre, executive director of the Illinois Humanities Council, will speak on the IHC’s Public Discourse program and discussion of contemporary issues in ways that are passionate, yet thoughtful and respectful. Leslie Goddard, a historical interpreter and author, will portray a women’s suffrage activist and share stories of the women’s suffrage movement. The program will take place on Thursday, November 13, 2014 from 11:30 a.m. until 1:30 p.m. in the Public Affairs Center (PAC) Conference Room C/D, located on the lower level of the PAC on the UIS campus. The cost for the hot buffet lunch and program is $20/per person. Reservations are requested, as seating is limited. Seating is available in the back for those who do not purchase the luncheon buffet. A discounted series subscription is available for $50/per person. The program is presented by the UIS Alumni SAGE Society and Illinois State Historical Society. The final Lunch & Learn event for 2014 is “Celebrating the Holidays” on December 11. These lunch-time programs will stimulate thinking as they build upon the university's tradition of open and intelligent dialogue. For more information, contact the UI Alumni Association at UIS at 217/206-7395 or email alumni@uis.edu. University of Illinois Springfield students will be going door-to-door on Halloween night collecting canned goods for the Central Illinois Foodbank. A total of 14 teams, consisting of nearly 200 students, have registered for the annual Trick or Treat for Canned Goods drive. The teams have been assigned specific neighborhoods to collect non-perishable food items. Earlier this month, the teams canvassed the neighborhoods and distributed door hangers that explained the project. The goal is to collect more than 10,000 pounds of food. Collected items will be returned to campus and weighed following the drive. Prizes will be awarded to the teams that collect the most food. The Central Illinois Foodbank distributes over 8.5 million pounds of food annually to over 150 food pantries, soup kitchens, residential programs and after-school programs in a 21 county region. For more information on Trick or Treat for Canned Goods, contact Mark Dochterman, director of the UIS Volunteer & Civic Engagement Center, at 225/921-9398, or go to www.uis.edu/volunteer. The UIS students will be collecting the canned goods between the hours of 4:30 p.m. and 8 p.m. 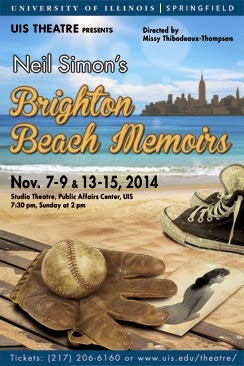 The Theatre Program at the University of Illinois Springfield presents Brighton Beach Memoirs by Neil Simon, opening Friday, November 7. Six performances will be presented in the Studio Theatre, on the lower level of the Public Affairs Center at UIS - on Friday, Saturday, Sunday, November 7, 8, and 9, and Thursday, Friday, Saturday, November 13, 14, and 15. All shows will begin at 7:30 p.m., except the Sunday performance (November 9), which will begin at 2 p.m. UIS Associate Professor of Theatre Missy Thibodeaux-Thompson directs the play. Neil Simon’s first play in the “Eugene” trilogy won the New York Drama Critics’ Circle Award for Best Play in 1983, and was a nominee for the Drama Desk Award for Outstanding New Play. The original Broadway production earned Tony awards and nominations for actors and direction. The cast includes UIS students Diamond Dixon, Emily Hartney, Courtney Kincaid, Christopher Romero, Wesley Skym, Liza Torrence, and Nicholas Jimenez, along with community member Liam Schaver. Dathan Powell, UIS assistant professor of theatre, is the scene designer/technical director. UIS students Christina Craig, Janaye Godawa, and Angelina Russo comprise the stage management team. Community member Debi Iams is the costume designer, and UIS staff member Kevin Zepp is the lighting designer. Sound and research/design is provided by UIS student Chip Deiss. Ticket prices are $14 for adults; $12 for senior citizens (65 or older with a picture I.D. ); $10 for UIS Faculty/Staff; $8 for UIS students (and all other college-level students) with a valid, current i-card or college I.D. card; and $6 for 17 and under. Please note that a service charge from Sangamon Auditorium, not included in the prices above, will be added to each ticket price, at the time of purchase. To avoid a higher service charge, buying tickets in person at the Sangamon Auditorium ticket office is highly recommended. You may also purchase tickets over the phone by calling 217/206-6160 or online at www.uis.edu/SangamonAuditorium/. For more information on the production, contact Missy Thibodeaux-Thompson at 217/206-8307 or mthom1@uis.edu, or visit www.uis.edu/theatre. Join UIS students, faculty, and staff to share an evening of cultural exhibits, artistic performances, food tasting, and more. WHEN: Friday, October 24, 2014 from 5-8 p.m.
WHERE: The Recreation and Athletic Center (TRAC), located on the south side of the UIS campus. Parking is available in lot F and I, located next to TRAC. A map of the campus is available at www.uis.edu/maps/. 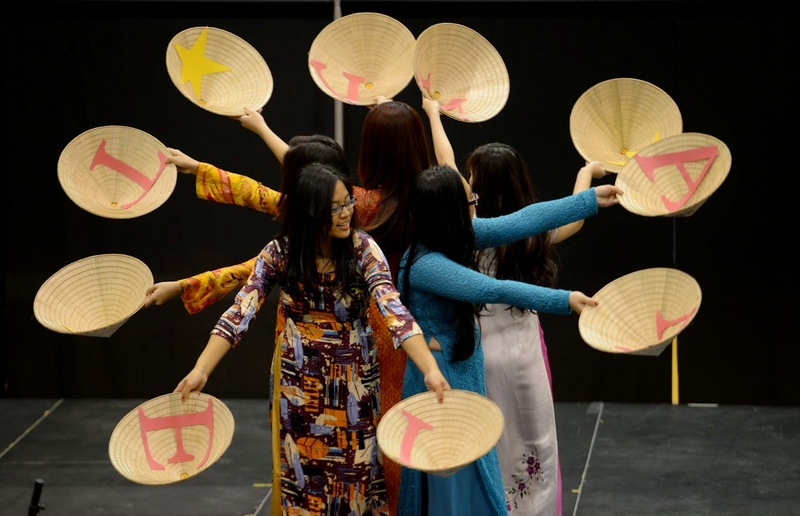 DETAILS: For over 35 years, the University of Illinois Springfield family has celebrated its rich international and cultural diversity with the annual International Festival. Some of our friends from the greater Springfield community will be joining UIS students, faculty, and staff to share an evening of cultural exhibits, artistic performances, and food tasting. Admission is free and the event and is open to the public. Countries and organizations that will be represented include several African nations, China, India, Ireland, Peru, Turkey, Scotland and more. Visitors will have a chance to sample delicious ethnic dishes from China, India, Mexico, Italy, African countries, the Middle East, and more. Guests will have the opportunity to collect some of the recipes into a book during the event. Be sure to pick up a program as you enter, so that you can find your way to the exhibits, cuisines, and performances that you are most interested. Plan to spend some time getting to know people you have never met before, literally from every part of our world! For more information, please contact the Office of International Student Services at 217/206-6678 or e-mail iss@uis.edu. UIS War on Poverty Forum hosts screening of documentary film "American Winter"
The University of Illinois Springfield, in collaboration with the Illinois Association of Community Action Agencies, continues its focus on poverty in the U.S. with a documentary feature film titled American Winter on Monday, October 20, 2014 from 6 to 9 p.m. in Brookens Auditorium, located on the lower level of Brookens Library. Produced and directed by Emmy award-winning filmmakers, Joe and Harry Gantz, American Winter is a documentary film that follows the personal stories of families struggling in the aftermath of the worst economic crisis since the Great Depression. Filmed over the course of one winter in Portland, Oregon, American Winter presents an intimate and emotionally evocative snapshot of the state of our economy as it is playing out in many American Families. The film screening is the second part of a War on Poverty Forum series which will also feature a War of Poverty Panel Discussion on Nov. 12. For more information, contact Lorena Johnson, program director in the UIS Institute for Legal and Policy Studies, at 217/206-6079 or ljohn04s@uis.edu. The 12th Annual Lincoln Legacy Lectures presented by the University of Illinois Springfield will be held from 7 to 9 p.m. Thursday, October 16, 2014 in Brookens Auditorium, located on the lower level of Brookens Library at UIS. 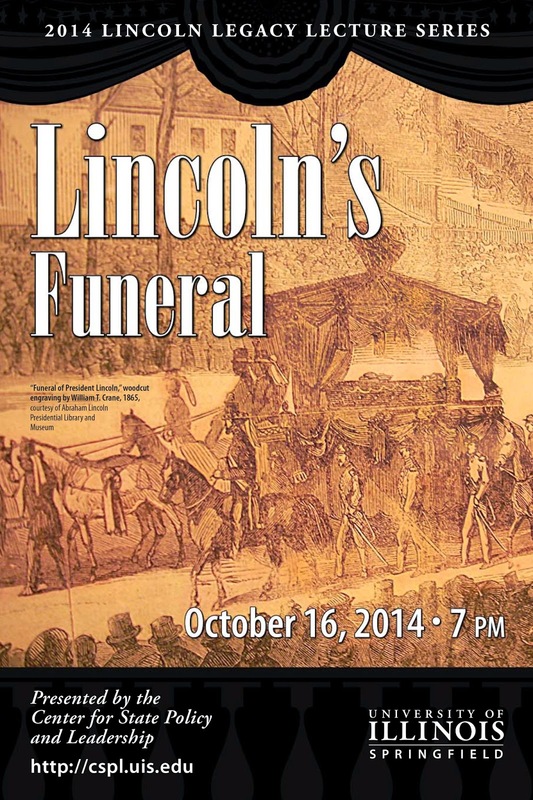 This year’s topic is “Lincoln’s Funeral,” in anticipation of the commemoration of the 150th anniversary of Lincoln’s death and funeral in 2015. The lectures, and a reception and book signing that will immediately follow, are free and open to the public. No reservation is required. The Lincoln Legacy Lecture Series brings nationally known scholars to Springfield to present lectures on topics that both engaged Abraham Lincoln and the citizens of his era and are still timely today. This year’s featured speakers are James L. Swanson, senior legal scholar at The Heritage Foundation, and Dr. Richard Wightman Fox, professor of history at the University of Southern California. Dr. Michael Burlingame, Naomi B. Lynn Distinguished Chair in Lincoln Studies at UIS, will give opening remarks on “Why Lincoln was Murdered,” and serve as moderator. Swanson will present a lecture titled “I give you my sprig of lilac”: The Death and Funeral of Abraham Lincoln.” In his lecture, “What We’ve Forgotten about Lincoln’s Funeral, and What We’ve Never Known,” Fox will examine what the loss of Lincoln signified to citizens of his time. Swanson is the author of Manhunt: The 12-Day Chase for Lincoln’s Killer (Wm. Morrow, 2006), its sequel Bloody Crimes: The Funeral for Abraham Lincoln and the Chase for Jefferson Davis (HarperCollins, 2011), and End of Days: The Assassination of John F. Kennedy (Wm. Morrow, 2013). Fox is the author of the forthcoming Lincoln’s Body: A Cultural History (Norton, 2015). Burlingame is the author of the two-volume biography, Abraham Lincoln: A Life (Johns Hopkins University Press, 2008). The Lincoln Legacy Lecture Series is sponsored by the UIS Center for State Policy and Leadership in cooperation with the Lynn Chair in Lincoln Studies. Co-sponsors of this year's event are the Abraham Lincoln Association, UIS College of Liberal Arts and Sciences, UIS College of Public Affairs and Administration, Shelby Cullom Davis Charitable Fund, UIS Engaged Citizenship Speaker Series, Laurie and David Farrell, Jim and Linda Gobberdiel, Illinois State Historical Society, Illinois State Library, Staab Funeral Home, University of Illinois Alumni Association, and WUIS/Illinois Issues. Seating in Brookens Auditorium is limited; however overflow seating will be available in the Public Affairs Center, Level 1, Conference Rooms C/D and G, where the audience can watch a large-screen live video feed. Those unable to attend in person can watch a live webcast by going to www.uis.edu/technology/uislive.html at the time of the event. For more information, contact Barbara Ferrara in the UIS Center for State Policy and Leadership at 217/206-7094.